This is basically a population density map of course, but the data is intriguing for many reasons and the subject matter of listening to the radio on road trips is full of nostalgia. Your first reaction might be: is this just another population density map? So what we have in these maps is more like the geographic regions where each radio format/genre is considered important, or are good predictors of sales/popularity. All caveats aside, there are some very interesting trends in the geographies vs genre, which largely track racial and socioeconomic distributions. 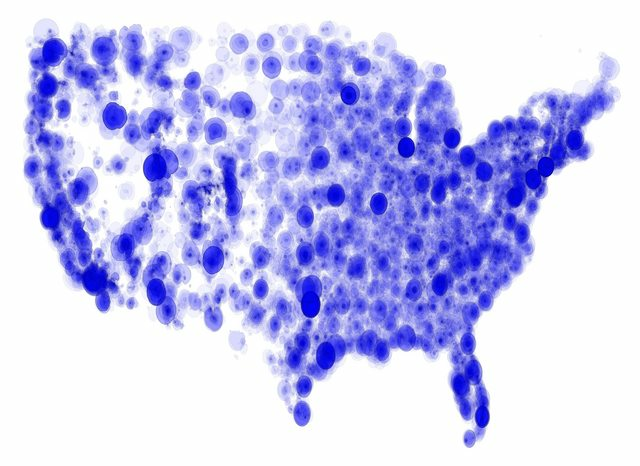 For my next post on the distribution of radio stations in the US, I'm working to compile a larger database of most every station with a known format. So far I'm aggregating tables from wikipedia, but if you have a line on a more complete list drop me a line! Then I'll be able to discuss the actual geography of musical tastes in the US. The long term goal for this ongoing project is called RadioTrip, where users could get map directions and radio suggestions along the way based on musical taste. If you want to help with this project, let me know or ping me on GitHub!